Ever since Donald Trump won the Republican nomination for President, he has faced treachery from within his own party. Anti-Trump RINOs continued their scheming even after Donald Trump won the presidency. And Mitch McConnell just stabbed Donald Trump in the back in this terrible way. Donald Trump plans on making the economy and immigration the central pillars of his re-election campaign. And the swamp is pulling out all the stops to defang those talking points for President Trump. The Federal Reserve tried to choke off economic growth last year and many Trump supporters feel the central bank could try and tank the economy to get rid of President Trump in 2020. President Trump has the ability to appoint nominees to the Federal Reserve Board of Governors. Past presidents appointed political advisors and campaign hands, but the fake news and RINOs in Washington reacted in horror when President Trump announced his intention to nominate former presidential candidate Herman Cain and economic advisor Stephen Moore to the Fed. 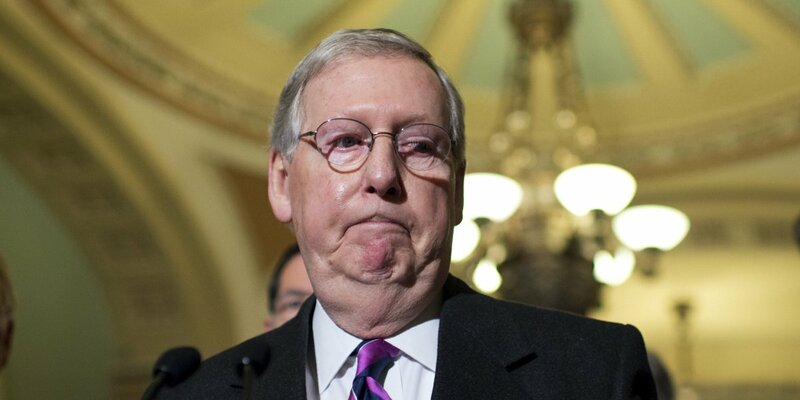 Mitch McConnell and other RINOs like Mitt Romney and Lisa Murkowski immediately worked to tank their nominations. “There was a lack of enthusiasm among a number of our members about that particular nominee,” McConnell said on CSPAN about Herman Cain. McConnell also worked in public to tank a possible Trump nominee to run the Department of Homeland Security. Trump sacked former Secretary Kirstjen Nielsen and other department leaders because they would not implement his policies cracking down on illegal immigration. Former Virginia Attorney General Ken Cuccinelli’s name appeared in the press as possible replacement. Cuccinelli is a hard-line conservative on immigration and he would serve the President well running the Department of Homeland Security. But McConnell and the rest of the RINOs in Congress are sniping at Cuccinelli in the press and thundering that they won’t confirm him. McConnell and the rest of the pro-open borders RINOs in Congress hate Cuccinelli because he took a job as President of the Senate Conservative Fund. In 2014, the Senate Conservative Fund – which was founded by former South Carolina Senator Jim DeMint – support now Kentucky Governor Matt Bevin in his tea party inspired primary challenge to Mitch McConnell. The group also supported primary challengers against RINOs in South Carolina and Mississippi. McConnell told reporters that Cuccinelli’s position for a group working to hold Republican Senators to their campaign promises rendered him a nonstarter for confirmation. By denying Trump his picks for the Fed and Homeland Security, McConnell and other anti-Trump RINOs are threatening the President’s re-election campaign. We will keep you up to date on any new developments in exposing the RINOs’ attempts to sabotage the Trump “Make America Great Again” agenda.